Exercise young imaginations and develop fine motor skills with the Alex Jr. Wooden Whimsy Blocks Baby Toy. 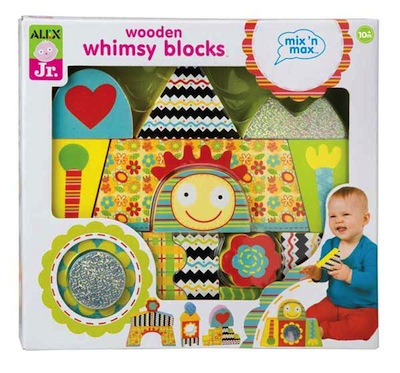 The set of 15 wooden blocks features a variety of patterns and colors, designed so children can build different people and places out of the same set of blocks. The blocks' unusual shapes supply toddlers with a wide set of textures and structures to inspire their creativity and build new skills.